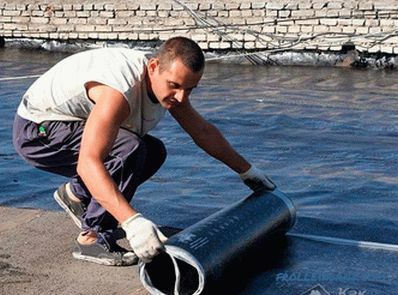 Stekloizol is a reliable waterproofing material that provides roof protection for 20–25 years. It is made of fiberglass or fiberglass, impregnated with bitumen and covered with a protective layer. The material is produced in rolls, used for roofing or as a waterproofing lining. In the first case, powder is applied to the outer layer, protecting the bitumen from ultraviolet and giving strength, and the inner part is covered with a plastic film. In the second case, the material on both sides is protected by a film. Steloisol or euroroofing material is an improved modification of the known roofing material. In the modern version of the material the basis is changed, instead of cardboard fiberglass is used, highly oxidized bitumen is applied, a protective polymer film is used. All these changes made it possible to increase the operating time from 3–5 years to 15–20 years. Let's figure out how to cover the roof with glass insulation. To cover a new roof or to repair an old one, no special knowledge is required, working with euro roofing is not difficult even for a beginner. The special marking on the rolls gives the necessary information about basis, protective layers, weight of material. The first letter is the name of the base: T is fiberglass, X is fiberglass. The second letter - K - roofing material with granular mineral sprinkling on the top layer. It is used as a flat roof topcoat or for external waterproofing of construction sites. P - lining stekloizol having a polymer film on both sides. 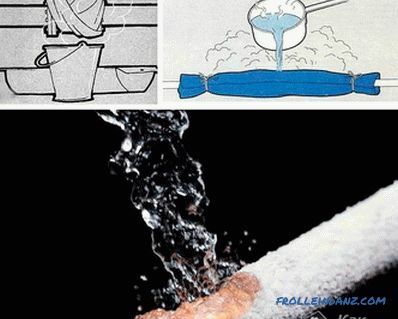 It is used in the lower layers of waterproofing. The third letter - P - polymer film. Digit - indicates the weight of the roll. Low weight simplifying the roofing process. The fabric-based material has an increased tensile strength, it is recommended for a high-stressed roof. The thickness of the bitumen layer affects the total weight of the roll: when applied 2 mm, weight 25 kg, and at 4 mm - up to 40 kg. 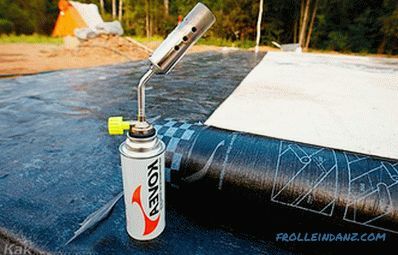 Stekloizol optimally suitable for waterproofing a roof that has a slope of up to 10 degrees. Typically, the roll width is 1 meter, its length is 10-15 m. The edge of one edge is made without an external coating, this part is left for overlap. Stekloizol is used for waterproofing bridges, tunnels and swimming pools, as a lining in a roofing cake, for the device of a flat roof. special roller or piece of pipe with a diameter of 20 cm. Before covering the roof , its surface is thoroughly cleaned and prepared. Outdated coating is completely removed. The concrete base is inspected, all found cracks and gouges are smeared with a solution of sand and cement. The surface is covered with a primer having a polymer base or bitumen mastic. This layer enhances the adhesion of stacked stekloizola and base. 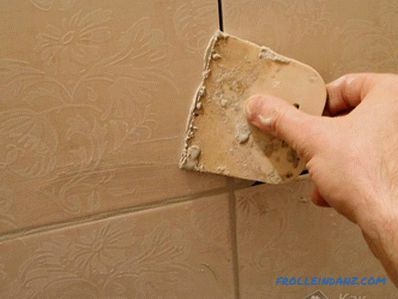 It is applied with a roller or brush, if the surface has a significant area, the roller is attached to a long handle. A continuous crate is made for the wooden roof. Will require edged board or sheets of moisture resistant plywood. Bitumen mastic is also applied on them. 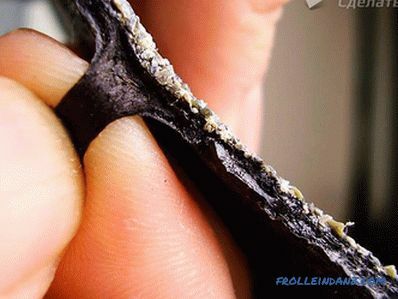 After the mastic hardens, they proceed to the laying of the rolled material. Using a water-based primer allows you to quickly proceed to the next step. 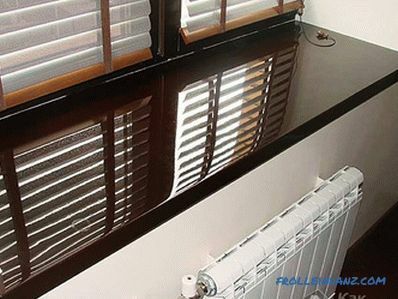 It is not necessary to proceed to the flooring of euro-ruberoid without preliminary waterproofing - later it will lead to leaks. The coating is started with warm and dry the weather. Cutting material occurs at the work site. Cutting the strip of the desired length, you must leave 20 cm for overlaps. In the glass is already marked part of the material, designed to perform overlap between adjacent rows. The first layer on the roof is laid lining stekloizol, marked with HSP and TPP. The number of layers is caused by the slope of the roof. 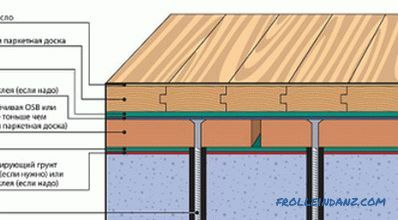 On flat roofs, it is recommended 2–3 layers, laid with offset joints. Next, start laying from the edge of the roof. The roll of roofing material is rolled out in small parts, heating them with a blowtorch and sticking to the base.It is necessary to heat not only the material, but also the bitumen base. 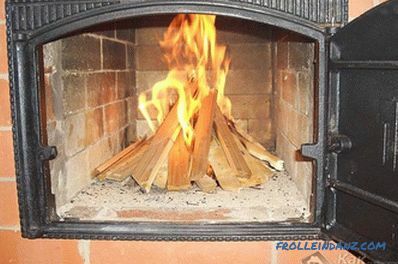 A sufficient degree of heating is determined by the indicator film. Pressurized glass is rolled onto the roof with a special roller or pipe until all air bubbles are removed. Gradually unwinding the roll, consistently stick it to the end. The next row is overlaid with an overlap of 10 cm on a special strip devoid of mineral dressing. The whole process of gluing is repeated as in the previous row. At the junction of pipes or other structures, an overlap is performed on both surfaces. Affordable price, simple installation and high reliability have made glass insulation a popular roofing material for small buildings. This is the best choice to cover the roof of the garage. All work can be done independently and in a short time. Initially, the roof needs cleaning and preparation. A layer of bitumen mastic is applied on a clean surface. 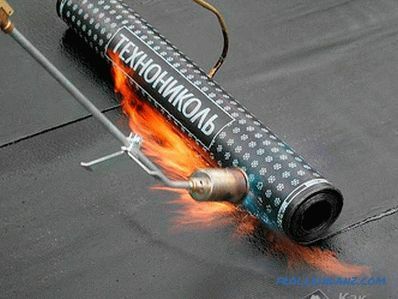 A roll of glass fiber is heated by a propane torch and pressed to the base. For durability rolled with an iron roller. Work on a small and level roof of a garage does not take much time. 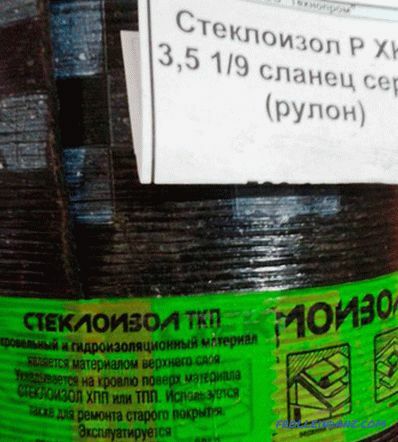 Do not overheat stekloizol, otherwise coarse dressing may fall into bitumen and an unprotected area will remain. Some time after laying it is not necessary to walk on the planed material in order not to damage it. The result of careful laying of glass insulation, which takes into account all the features of the material and installation technology, results in a roof protected from moisture, which will last more than 15 years. Another advantage of this roof is the ability to repair a separate section of the roll covering. If you are not confident in your abilities and do not know how to properly glass-proof glass on the roof, look at one of the video reviews presented.